What would you expect when Salman Khan, Kabir Khan and Yash Raj Films team up- a super masala entertainer, right? Salman Khan and Katrina Kaif’s Ek Tha Tiger has been one of the most awaited films of the year, and we must tell you first off that it was well worth the months that we twiddled our cinematic thumbs for it to reach the theatres. Director Kabir Khan has made a desi spy thriller that lives up to all the expectations that the makers have built up over the last year or so. After ‘Wanted’, ‘Dabangg’ and ‘Bodyguard’, ‘Ek Tha Tiger’ - yet another Eid release of Salman Khan - might just make it to the Rs100 crore club, courtesy his incredible fan following and an intriguing first half. But the film sadly falls in the same trap like other Salman films which lack content. Reviewing a Salman Khan film is like ironing a pair of jeans (as i never do so): really, what’s the point. People will watch it anyway. India is in safe hands with RAW spies like Tiger (Salman Khan) who chase, beat and gun down enemies of the state no matter which foreign country they are in. For 12 years, he’s gone without leave, from one international assignment to another. Forever on the move, Tiger’s latest assignment is to observe the movements of a certain Trinity College scientist in the Dublin(Ireland). Accustomed to using his fists for getting information, our desi 007 finds it a bit difficult to get close to this aloof scientist. In the guise of a writer, Tiger prances around with Zoya(scientist's house keeper played by Katrina Kaif) and ends up falling for her; just as his colleague Gopi (Ranvir Shorey) had warned him not to. Tiger introduces himself as Manish Chandra aka Doordarshan and seeks her help in getting an appointment with the professor which is a laid on step for the rom-com to unviel and give an end to the minds muddle and heart's song which now, he will sing out loud. It’s hard to tell whether Zoya is just another student or related to the scientist, usually hangs out in his house. The scientist could be passing on national secrets to the ISI. But you don’t know that yet. or you do. What did you think? While the scientist character entirely disappears from the screen, Salman, being followed by various other agents in Ireland, like before in Iraq( where the rom-thriller flick opens), and later in Cuba, cuts to the chase: running over a tram as it collides against a mini-truck, or sliding down a staircase on a ledge, shooting with two guns at the same time. Local police usually look on! Zoya, who also happens to be a dance instructor, invites Tiger for a show and here is where you would find a twist in the tale! The girl, it turns out, is an ISI agent. “Of over 200 countries in the world, Tiger had to fall in love with a Pakistani,” laments the RAW chief (Girish Karnad). Certainly this is beyond his call of duty. The government would go after Tiger of course. The mechanics of how the RAW operates is treated with fair realism. The ISI gets a bad name globally. From all accounts, given the kind of undisclosed money spent on Indian intelligence agencies (it could run into trillions), India is no Gandhian, soft state either. You would’ve seen some of the film’s best action scenes already. But that is to take away nothing from the effort that may have gone into putting these stunning sequences together. Hollywood achieves similar results with over 10 times the budget. In a departure from earlier Salman pictures, the heroine gets her fair share of jumping off buildings, flying planes, and knocking a punch or two. First half of the movie seems to be a well directed 'Agent Vinod' which later on flows down in the second half, code-breaked Doordarshan meeting Zee(Zoya) at U.N.O meet in Istanbul(Turkey) where she clarifies her deep-driven heart's feeling of being in love with him but as she was a patriot, refuses to be a part and parcel of RAW. Very next day after the ball, they come out to a conclusion of running away and later the 'International Ishaqzadee' begins with a better climax scene shot down in the beautiful Bahamas. ticketing website) which gave me a confirmed first day-first show ticket at one of the renowned multiplex of Chennai .Yet, never in my recent memory have I seen long line, all the way outside a mall, trying to get a ticket, no matter whatsover they have to pay instead.... 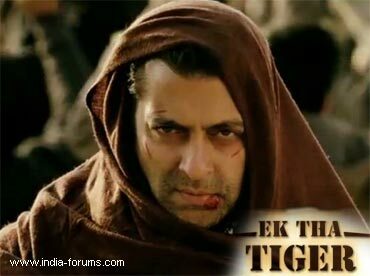 It's Chennai and the rush for Ek tha Tiger ensures its massive booking in the other cities where the people speaking Hindi is quite a large...... I even saw a few of my Tamil friends in the theatre who just know 'Ha' and 'Na', the two absolute words of Hindi , I don't know what all they understood but it's for sure it was even a 'Paisa Vasool' show for them seeing Katrina flying a private jet and Salman entering in the cockpit with his bike high on the octane- flame with background shooting from both Gopi(RAW) and an ISI agent. If such is the scene here, its only Independence Day. Eid is yet to come. There is still a whole weekend to go. As they say, “Jab khuda mehrbaan....” Well, I would rather not finish that sentence. At least this Salman film was worth it. For the first time since Chulbul Pandey (Dabangg), the actor's played a character, which to begin with is saying a lot. The music of the movie is flat and boring, just a song 'Saiyara' soothes the ear. 'Mashallah' seems to be repeated arabic-indo mystic which is bad when it comes to its lyrics but Katrina's sand dance gives it's video an A-rate. After a flop(Kabul Express) and a semi-hit (New York). the director is succesful to rope in Salman Khan for his first commercial success. One advice:- Please don't waste all your money and energy in Ek tha Tiger, Chulbul Pandey will be again back with Dabbang-2 ,later this year .